There's nothing in the natural world that comes close to the majestic brilliance of being beside one of Scotland's famous salmon rivers with a fly rod in your hand. Pull yourself away from the concrete and computer screen nonsense that our species has been afflicted with and get some natural excitement back in your life. If you're a vegetarian you can kid yourself on all you like but our evolution was based on predatory instincts that are deep routed in our DNA regardless of our modern day food preferences which will make salmon fishing feel natural even though we release what we catch these days for worthwhile conservation reasons. I've always personally had a fascination with anything that relates to the phrase 'something out of nothing' and none more so that landing the most perfect fresh run salmon from a river that has given away absolutely zero signs of its presence. The capture of a wild Atlantic salmon is a truly fantastic achievement on any river as technically these fish are not feeding in fresh water. 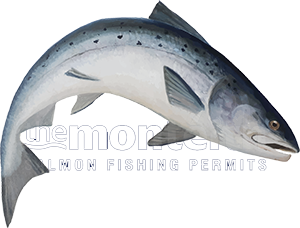 A salmon packs its main bodyweight on in the ocean and only returns to fresh water to reproduce so this should heighten the challenge in making one come to intercept your fly or lure. It's not hunger that will make a salmon take but a deep routed hunting reaction is what you've got to work with. Logically this reduces your chances of success however a correctly controlled salmon fly can be highly effective at times. Take time to fine tune not only your salmon fishing skills but to study the really attractive additional attributes that go hand in hand with this amazing Scottish pursuit. The only real way to describe this sport accurately is 'multi dimentional' as much more is involved than simply turning up on the river with a fishing rod as you will quickly learn. Treat yourself to a riverbank PHD in the natural & spiritual side of salmon fishing and open up your mind to the 'possibility thinking' that comes with searching for these fine specimen fish in the beautifully formed pools of Scotland's finest rivers. When you eventually get hold of a salmon and successfully land it you'll be thrown into a much higher state of satisfaction than modern day living can offer and be assured of that fact.